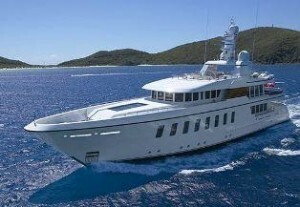 Trideck Yachts for Sale Worldwide! 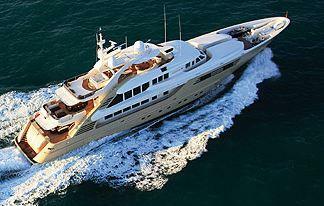 Please see our comprehensive database for all trideck yachts for sale worldwide! Click here for our custom VIP Search – tell us what you have in mind and we will find it! Trideck yachts (tri-deck yachts, tri deck yachts) are a popular style of motor yacht typically starting in the 100’ (33m) – 200’ (62m) size offering three levels of decks (thus ‘tri’ or triple deck) plus a fly bridge (or sunning) area. These designs are especially popular in North America, Caribbean and Europe , as they offer a huge amount of volume and versatility for their size. Trideck yachts are typically arranged with a main deck featuring an open aft deck with a settee, followed by a large salon, a dining area, then a galley with a master stateroom (or on-deck master stateroom) forward. The lower deck offer private guest accommodations of 3-6 staterooms. Crew accommodations are usually found forward and accessed via the galley area. An upper deck usually finds an enclosed sky lounge area (acting as a second salon or sometimes another master stateroom), wheelhouse and an aft deck (which often provides a boat deck for tenders combined with a more private ‘al fresco’ dining area). A fly bridge, or sunning deck is usually found topsides with space for a Jacuzzi, wet bar and lounging area. Many trideck yachts also feature a forward area near the bow with a settee for enjoying the ride and sunsets. 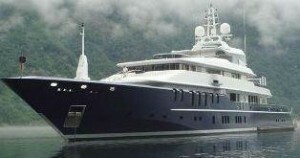 Given the above layout, most trideck yachts offer 4-5 owner/guest staterooms (in the less than 140’ range, with extra staterooms added above this level), which will comfortably sleep 8-12 owners & guests as well as providing comfortable quarters for 4-6 crew (note that crew size required to maintain the yacht and guests increase with size and guest accommodations). Trideck yachts are built of three materials – FRP (fiberglass), aluminum or steel with an aluminum superstructure. Fiberglass tri deck yachts (fiberglass sandwich construction using a lightweight core material) , such as built by Westport in Washington, USA, weigh less than the metal tridecks, thus offering more speed. Metal trideck yachts offer more versatility in styling (as a form needs to be built for a FRP yacht and thus dictates a design with commonality to other models) and are considered to have more long-range capabilities due to the strength of materials used and the displacement nature (slower speeds) due to the weight limitations. Modern tri-deck yacht builders employ the best possible methods to construct yachts and thus most of the used tri deck yachts available are extremely well-built and retain excellent value. A wide variety of interior styles are available (especially on custom yachts). Many owners prefer to customize the interior ‘soft goods’ to personal tastes when buying a used yacht. Almost all trideck yachts feature interiors with exotic wood paneling including cherrywood, sapele or anigre (mahogany), teak or maple, along with granite countertops and portions of the flooring. Where you want to cruise makes a difference! Consideration should be given to the areas desired to cruise the yacht in. For example, the Bahamas offer 800 plus islands and require a draft (depth) of less than 8’ (ideally 6.5’). This limiting factor, coupled with the availability of berth sizes in popular marinas, is what makes medium-sized trideck yachts (less than 150’) more versatile. Where do most yachts this size cruise? Eastern North America yachts cruise the Bahamas, near and far northern Caribbean islands, Florida, the Northeast coastal cities and the Great Lakes. Western North American boats cruise Central America and Mexico (especially the Baja area), up the western seacoast to the Pacific Northwest and up to Alaska. Transport ships are a convenient way to enjoy cruising Europe (primarily the Mediterranean area) and also offer service to distant destinations such as the Western Pacific (read Micronesia) and Australia/New Zealand. Transporting a yacht saves time considerations along with wear and tear on the yacht while opening up destinations which only certain world-class yachts are privy to. Propulsion systems are typically twin Caterpillar or MTU diesels with horsepower ranges from 1,200 horsepower to over 4,000 horsepower each and direct, shaft driven propellers coupled to a transmission with speeds determined by hull design and horsepower. A displacement yacht will typically operate at lower speeds around 9-12 knots (nautical miles per hour) while a lightweight semi-displacement hull with plenty of horsepower will cruise at 16-20 plus knots (note increased fuel consumption). As with all yacht purchases, we highly recommend a thorough survey (by a well-known marine surveyor) on both the yacht and the machinery systems. Many owners choose to offset the cost of ownership by chartering their yachts. The rule of thumb is that 12-14 weeks of charter is usually sufficient to cover the ongoing costs of insurance, crew, maintenance, dockage, etc. However, charterers usually need to sacrifice key holidays in order to compete with the charter market, along with making it an ongoing enterprise with the best possible crew combined with a remarkably kept yacht. One advantage (aside from the expense offset) is that value may be ultimately added to the yacht with a history of chartering (provided that ongoing maintenance is performed). For more information on these trideck yacht builders, CLICK HERE! North America – Westport, Northern, Richmond, Christensen , Palmer Johnson, Trinity, Burger, and Delta. Ak Yachts, provides expert yacht brokerage and consulting services for yachts in this category of tri deck yachts for sale. We are located in beautiful Fort Lauderdale, Florida – the center of yachting activity for many Superyachts including sales and service. A variety of trideck yachts are for sale in this area, offering a wide selection of models to choose from at any given time. Please explore our database of used and new trideck yachts for sale. These listings are continuously updated with photos, specifications and layout drawings.